Four Season. Are there any two words more desired by ski resorts — most of which are on a never-ending quest to plug the non-revenue-producing hole that stretches from April to the end of November? Over the decades, lift-served mountains have added numerous attractions to generate cash flow during the off season: alpine slides, outdoor water parks, paintball, frisbee golf, lift-served and cross-country mountain biking, ziplines, even skiing on rubber mats — usually with limited success. 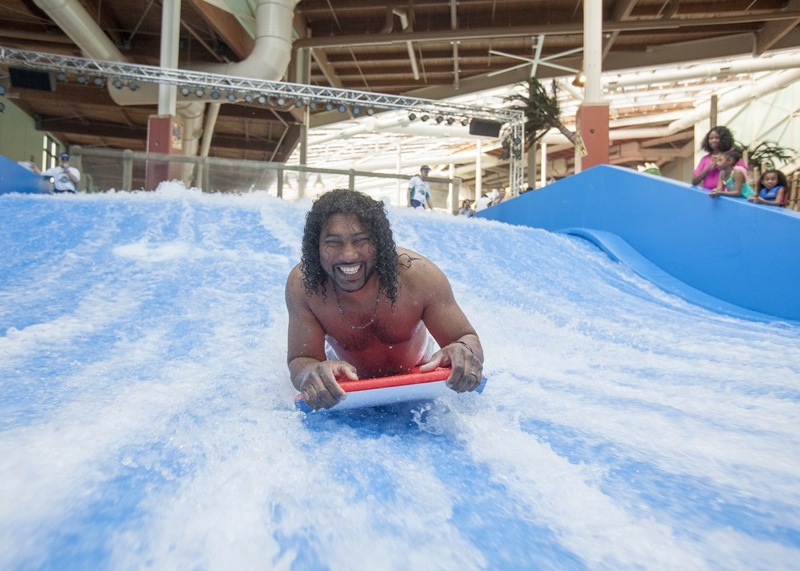 More recently, indoor water parks have been added to the menu of off-season options. 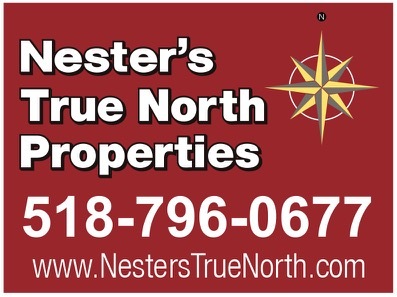 They have the added benefit of not only attracting paying guests year round, but also providing families with a Plan B for bad-weather days during ski season and a one-stop shop to keep increasingly jaded kids entertained. 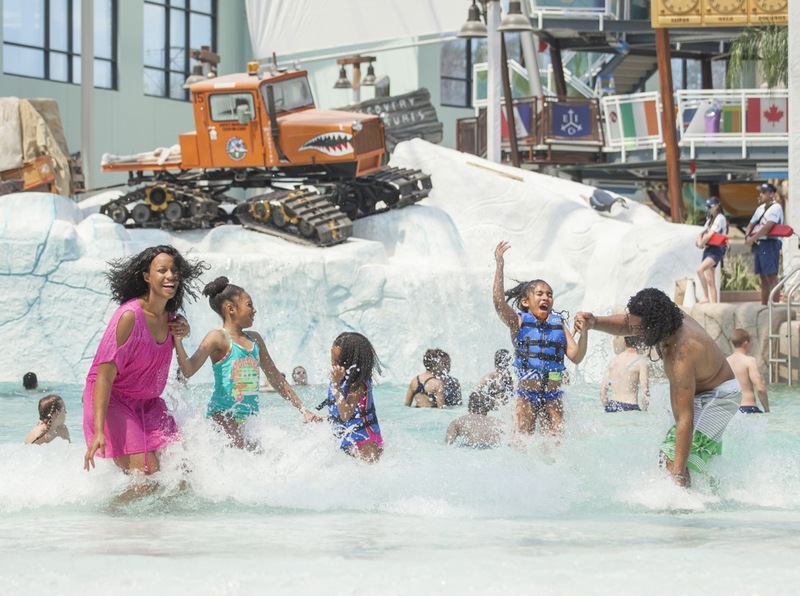 In the northeast, water parks have been already built at two ski areas, Jay Peak and Greek Peak – neither of which seemed like an obvious fit for something like this. For years, Jay had relentlessly branded itself as an old-school powder sanctuary that thumbed its nose at ski-resort bells and whistles while Greek had existed purely as a day area for locals, with no destination lodging or non-skiing diversions. In both cases, the addition of a water park turned out to be a big hit both with guests and bean counters in the back office. That’s why it’ll be interesting to watch how things progress at Camelback in Pennsylvania’s Poconos — a ski area that won’t require its marketing team to perform any strategic somersaults. With an existing outdoor water park, zipline, treetop obstacle course, and mountain coaster already in place, Camelback was already well on its way to becoming a four-season resort. The recent opening of its $163 million Lodge and Waterpark is the final and definitive step in this process. As part of an eight-story complex that will eventually encompass 453 luxury guest suites, the 125,000 square-foot Aquatopia features seven pools and 13 waterslides, along with numerous food and beverage outlets, including a swim-up bar. 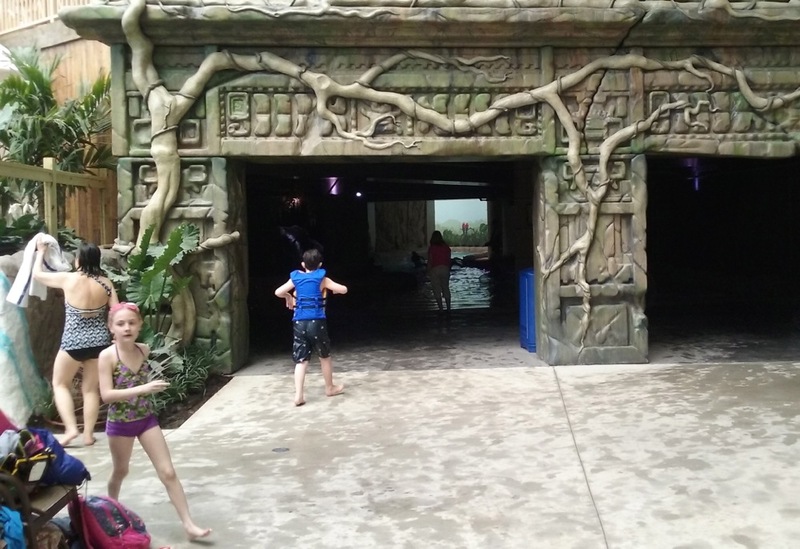 If you want a break from water-related activities, they have that covered too: an overhead ropes course, a climbing wall, laser tag, an arcade with 100+ video and interactive games, miniature golf, black light laser tag, and a spa/fitness center both for grown-ups and kids. 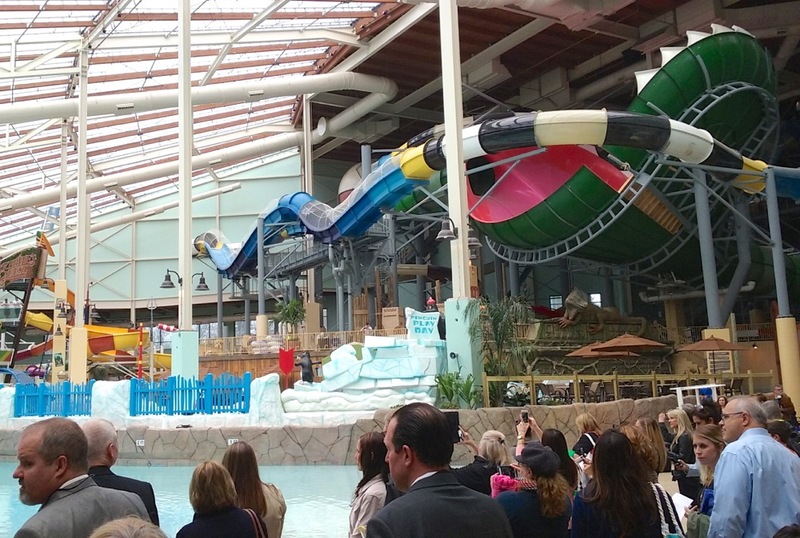 In an industry that puts a lot of value on superlatives, Camelback can now boast that it’s not only the largest indoor water park in the Northeast, but also the largest one in the U.S. that’s able to legitimately call itself ski-in/ski-out (it’s only a few steps from the high-speed Stevenson quad). Overhead is a 1.5-acre transparent roof, reportedly the largest such install in North America, which allows for year-round sunbathing. To staff this new complex, Camelback has hired 600+ full- and part-time employees including more than 150 lifeguards. As someone who’s always preferred back-to-the-basics ski areas and generally isn’t a fan of amusement parks, this visit forced me to switch gears and expand my comfort zone. 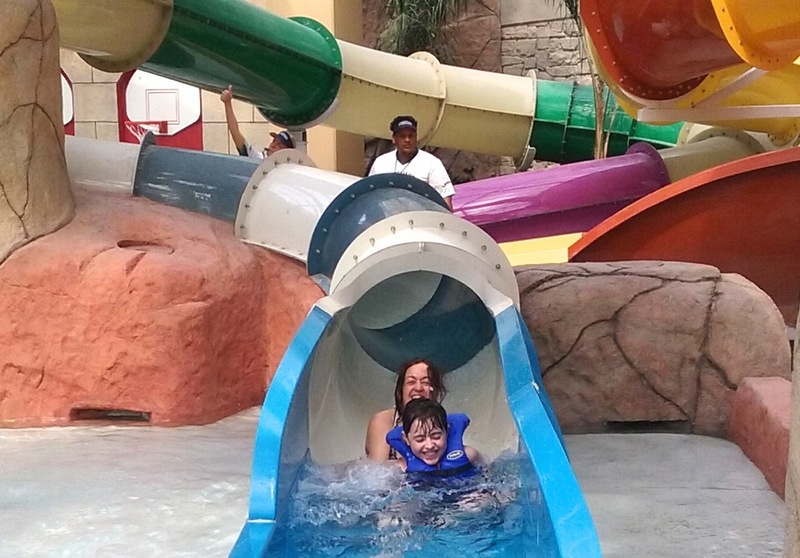 Within a few hours, Aquatopia’s end game became clear: an everything-but-the-kitchen-sink stage for families to have fun together. Based on what we experienced, they’ve accomplished this objective and then some. My ten-year-old son, who loves anything water-related, thought that he had died and gone to heaven while my wife really enjoyed the everything-in-one-place aspect. Two days later, I overheard her raving to a friend on the phone that it was the most enjoyable family outing we’d ever had. While a waterpark will never replace skiing for me, I guess that’s the whole point of locating it at the bottom of a ski area — during the winter, you and your kids won’t need to decide between one and the other. The larger story of Aquatopia is that it’ll be another part of the Poconos’ ongoing revival from a punchline for heart-shaped-bed-and-bathtub jokes to a family destination with all sorts of “adventure” activities. With manageable drive times from Philadelphia (two hours), New York City (90 minutes), and New Jersey (60-75 minutes), Camelback, located only a few minutes from I-80, has an enormous potential audience to draw from. Since the smallest percentage of the Poconos’ annual tourists currently comes during winter, it’ll be interesting to see how this new colossus will goose those numbers. How does the skiing compare to, say, Mountain Creek? Add this nonsense to the growing list of things making the once-great country a sterile shopping mall of stimuli and distractions that prevent the masses from experiencing some of the more simple and fulfilling things in life. Something about this really doesn’t appeal to me. This looks a real winner for Camelback. One should never say never Z – it could happen in Lake Plastic. Looks great, well MC’s Action Park is of course better, but it is only open from 6/13 to 9/7. I wouldn’t mind seeing a few more of these at different ski areas. It’ll give me an excuse to try out Camelback as well. One thing Mountain Creek has always done a great job with is off season activities. Like I said earlier, we have Action Park, one of the best downhill bike parks in the east, 7 golf courses, and even more stuff I don’t even know about. They are thinking about building an indoor waterpark, but I don’t know where they’ll put it. Their current slopeside hotel is embarassingly underutilized, so I think they’d have little motivation to build another. Maybe they could build one that would be connected to the current hotel in some way. Don has a great point. Glad I ski xc and I don’t have to see these things at my fave ski centers. Just stayed at a similar facility near Williamsburg, VA called Great Wolf Lodge for a family gathering. 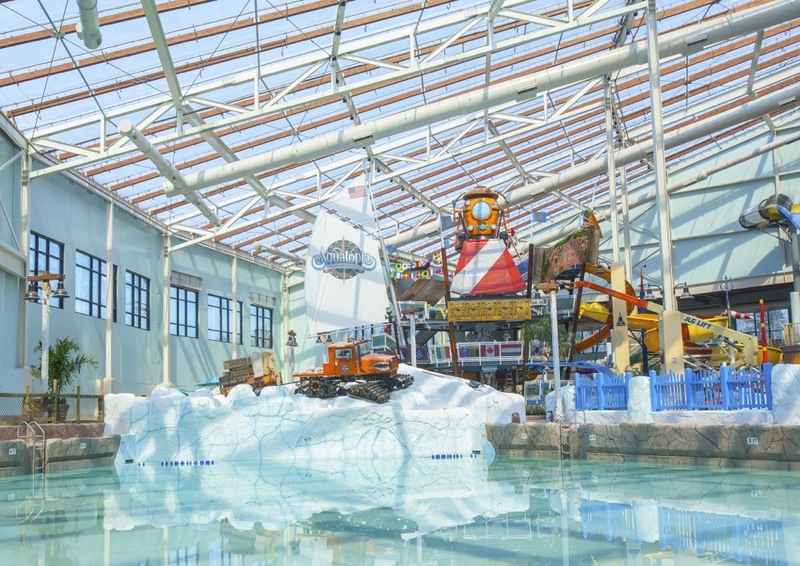 I’m not much of a water park person, but can’t help thinking that the concept of building these indoor water parks near ski slopes is a great revitalizer for small day-trip ski areas trying to expand their customer base. There is one at Massanutten Ski area in VA and it’s been a big hit too. Those who knock them might feel differently if they had young kids or casual skiing friends to entertain. I would like to try skiing here in coming April. Need to convince my friends!